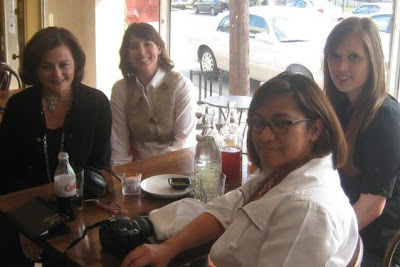 Yesterday, I had the pleasure of meeting and having lunch with three Houston bloggers, Courtney of In(side) the Loop, Joni of Cote de Texas, and Carolina of Carolina Eclectic. I had such a great time! I'll admit that I was a little nervous before I got there. I couldn't help but wonder: "What if they don't like me? What if we have nothing to say to one another?". I was quickly put at ease as I was greeted by Courtney. Friendly and vivacious, she feels like someone you've been friends with for years. She makes you feel right at home and has a fantastic personality. Carolina was the next to arrive. Shy and soft-spoken, she is incredibly sweet, has a passion for minimalist design, and has the cutest three year old son. We were soon joined by Joni. I caught my first glimpse of her through the window, as she tapped on it to let us know that she needed to move her car. Joni exudes the kind of confidence I hope to have someday. Steadfastly opinionated, Joni is a woman who knows what she likes and isn't afraid to tell you. She was quick to let me know that my post, Do you want an A or do you want to learn? had upset her. Ever the consummate blogger, she shared tons of blogging advice and juicy gossip with us. After we'd finished eating, it was decided that we would snap a few photos in order to properly document the meeting of the Houston bloggers. Courtney, Carolina, and Joni were properly armed with their cameras, but I had left mine at home because the batteries were dead. Carolina exclaimed "What kind of blogger are you?!" when I'd told them about my camera. Oh, the horror! Overall, I had a fantastic time and hope to do it again soon. It's always nice to make new friends who share similar interests. I "borrowed" these photos from Joni since I'm the kind of blogger who forgets to charge her batteries. Courtney, you're so sweet! I'm afraid some of my students would beg to differ. LOL! I know I keep saying that we should do this again, but I think it would be great if we could manage to make it a ritual of sorts. I am on board for making this a ritual...maybe we can throw in some shopping while we are at it. Call me whenever you are in town. 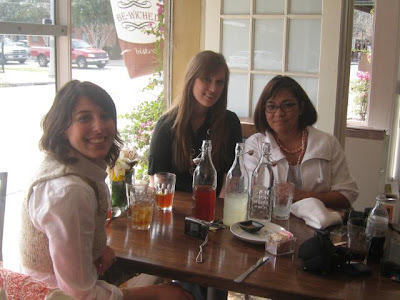 Carolina - I think it would be great to get together every so often, have lunch, and do some shopping! I totally understand what you mean about the shy thing. I am quite similar. It takes me a little while to really open up and once I feel comfortable enough around someone, watch out! How exciting, Paloma! Hey, call me next time. i love hearing all of your different takes on this little lunch date. so fun! That is so fun you met! Gimme a call when in California!